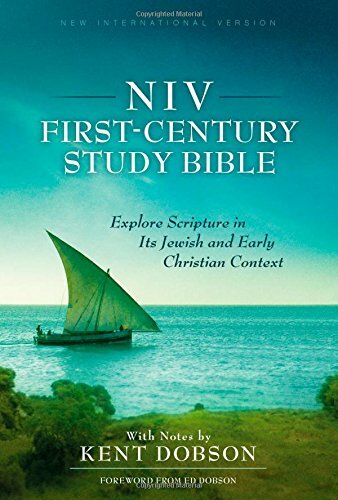 The NIV First-Century Study Bible (henceforth FCSB) is a breath of fresh air in the study Bible department. Instead of being specialized for a particular audience (e.g. women, men, students, teens, athletes, etc. ), the FCSB calls all people to “Explore Scripture in Its Jewish and Early Christian Context” (subtitle). Not lacking practicality, general editor (and note author) Kent Dobson provides an easy-access option for studying the Scriptures within the culture and worldview of the original audiences. This is accomplished utilizing traditional study notes, word studies, lengthy book introductions, and “Day in the Life” articles. Many of the notes in FCSB are tied to Rabbinical tradition or early Christian writing. The benefits of reading these non-modern perspectives, thoughts, and questions make the FCSB one of the most valuable study Bibles I have read through. Though these quotations and notes are responsible for producing an (awkward) endnote (1650-1661) and bibliography (1662-1664) requirement, I have yet to see an evangelical study Bible provide greater patristic and rabbinical insight (the only exception being the Orthodox Study Bible). These notes permeate the historical portions of the Scriptures more than the poetry or prophets. Similarly, the FCSB does seem to avoid delving too deeply into theological interpretations unless it relates to the original audience and cultural context. For example, the book of Isaiah and Jeremiah contain almost no notes on crucial theological points while notes pertaining to the Olivet Discourse provide strong culturally relevant (e.g. preterist, destruction of the temple in AD 70) notes (1233-1234, 1273-1274, 1327). In contrast, the book of Genesis provides outstanding notes on creation (1-10), covenants (16), literary elements (Gen 37:2; 47:28) and word studies (63, 89). These types of profound Rabbinical and patristic insights continue in the book of Exodus (84-88), book introductions (Psalms, 687-700; Zechariah, 1157-1160; Mathew, 1187-1192) and many word studies (e.g. “genealogy,” 1193; “guest room,” 1328). Notes explaining the interpretive methods of the authors and audiences are pertinent and challenging (1136; Matt 2:15, 1195; Rom 10:1-21, 1445). Along with written notes, the FCSB contains many beneficial (and colorful) graphs. Of these, “Integrated Chronology” (21), “Chronology of Foreign Kings” (436), “House of Herod” (1196-1997), “Jewish Sects” (1232) and “Life of Christ” (1238-1240) stand out for both their information and presentation efficiency. “Day in the Life” features also provide interesting essay on the life and times of the Scriptures (e.g. “Desert Shepherds,” 22-23; “Israelite Family,” 796-798). Beautiful pictures of ruins and historic artwork fill the FCSB. Highlights among the prophets include fifth-century mosaic of Daniel (1054), Jonah being swallowed (1114), the golden light stands of Zechariah’s vision (1163), and the final judgment (1171). In every element, the FCSB brings to life the historical and cultural context of the Scriptures. The notes and information help transport the reader into a place where the Scriptures are as relevant to the original audience as to our modern situation. In conclusion, Zondervan and Kent Dobson have put forth one of the most valuable and pertinent study Bibles available. The NIV First-Century Study Bible may not bring to life “application” for modern situations but it applies a wealth of historical knowledge and Scriptural insights to bring to life God’s word. I am not a fan of study bibles, preferring full commentaries, but the FCSB is now on my short list of recommended resources. In a day and age where every theological tradition has a study Bibles, the FCSB brings back to life the original views of the early church and Jewish Rabbis in a resounding and edifying way.